Glucoamyl L-209+ Product - CTE Global, Inc.
Glucoamyl L-209+ is a purified native glucoamylase that functions by the hydrolysis of terminal 1,4 linked alpha-D-glucose residues from non-reducing ends of polysaccharide chains with release of beta-D-glucose. Its application is to yield monomeric glucose molecules that can be fermented by yeast into biofuels of interest such as ethanol. Glucoamyl L-209+ provides the following benefits to ethanol producers. Glucoamyl L-209+ is used to saccharify liquefied mashes of whole ground corn. The resultant glucose is fermented by yeast to produce ethanol. Glucoamyl L-209+ has a broad operating range for enhanced process flexibility, and performs well within the temperature, and pH ranges typical in whole ground corn batch fermentations. In high gravity fermentations, performance can be further enhanced by the addition of SZM XT-20+ Fungal Alpha Amylase and/or SZM AP-1 Acid Protease. Glucoamyl L-209+ should be dosed at 0.048–0.065% weight enzyme / weight as is corn. The actual dose required will depend upon the conditions of your fermentation: time, initial pH and the level of solids. This product is not a GMO. The enzyme product is manufactured by fermentation of microorganisms that are not present in the final product. The production organisms and the enzyme effectiveness are improved by means of modern technology. 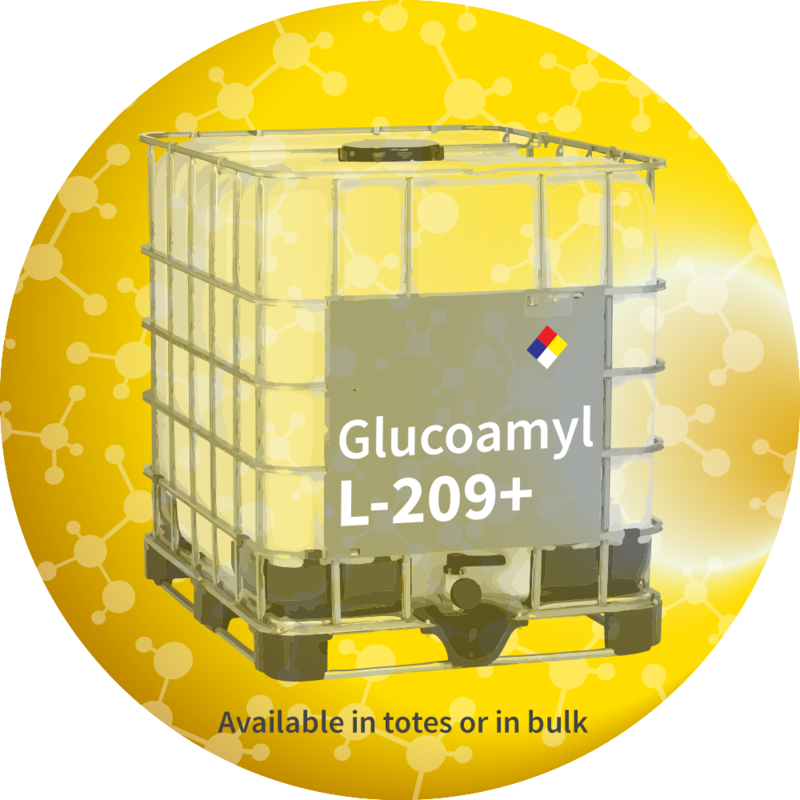 Glucoamyl L-209+ is available in totes or bulk tankers. Glucoamyl L-209+ will meet the declared activity upon arrival at your plant. Glucoamyl L-209+ can be safely stored in sealed containers. Enzymes should be stored below 77°F (25°C) and sheltered from direct sunlight for maximum stability. The enzymatic activity of Glucoamyl L-209+ remains at ≥ 95% for six months when stored at 77°F (25°C). The recommended dosage may need to be increased if stored for longer than six months. Glucoamyl L-209+ contains proteins obtained from large-scale cultures of a mold. Proteins may cause an allergic-type reaction in sensitized individuals that could require immediate medical attention. Prolonged direct contact may cause minor irritation to skin, eyes, or mucus membranes. For detailed handling information, please refer to the appropriate Safety Data Sheet. CTE Global, Inc. is committed to formulating a productive and mutually beneficial relationship with ethanol producers in order to make their fermentation process as consistent, efficient, and cost-effective as possible. Contact us with any questions or for more information about this product.